IN THE VIDEO BELOW, you can see Sir Simon Rattle conducting Carl Nielsen Symphony 4 for Danmarks Radio. 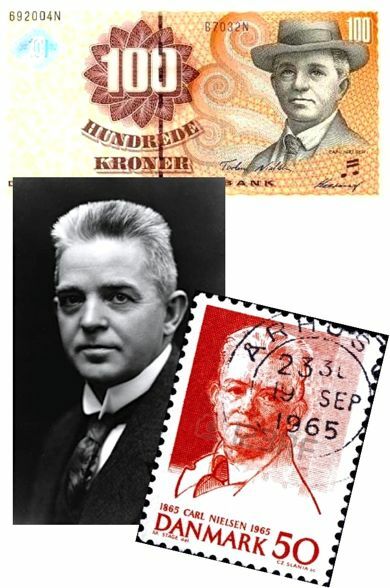 Carl Nielsen is considered Denmark’s greatest composer. He was also a violinist and conductor. He composed six symphonies, many concertos, a “Wind Quintet,” an opera, and many songs. He is regarded so highly in Denmark that his image was engraveD on 100-kroner currency. His international familiarity and acclaim continues to grow. Though Nielsen couldn’t give words to what he wanted, his struggle for expression came out in powerful form in his Symphony No. 4. Nielsen said that only music could express what he was trying to get out, “for music is life, whereas the other arts only depict life.” Other artists may take issue with Nielsen, but his symphony is full of intensity of feeling, passion, conflict, triumph, and life. At times Nielsen despaired for the future as the carnage continued, but he found faith in the persistence of the will to live. The war didn’t physically scar Denmark, but the battles are woven into his music culminating in the final movement when two sets of timpani engage in a climactic clash. The movements all flow into each other with a demanding intensity for the orchestra. The first movement begins with bursts of chaotic energy, then more calming and gentle in the second and third movements, culminating in the powerful clash in the fourth movement. The clash resolves in the life-affirming theme in E Major that brings the symphony to its glorious end.